Laundry, internet and utilities included room on golf course is renting for $600 with $300 in deposits required. Washer and dryer are included. Parking for one car is included. All utilities are included, including internet. Available immediately; later move-in considered. Terms are 12 months. Grocery store Sobey's is located a 4 minute drive away at Shoppers Mall, which has over 90 stores. 4 minute walk to the bus stop for the number 14 bus. Downtown is 16 minutes by bus and 9 minutes by car. 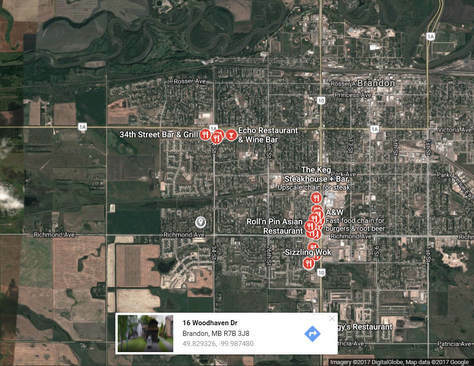 Brandon University is 15 minutes by bus and 7 minutes by car. With 18 restaurants a 6 minute drive away, this room is for rent at 16 Woodhaven Dr. The house backs onto Sunnyside Golf Course, which is accessible from the house via a walking trail. Greenery provides privacy for the backyard. This is a room for rent in a private house. Size of the room is 100 square feet. The house is a good size. Smoking outside only, Pets: no pets.